Why receive coaching & mentoring for your therapy business? I started my Practitioner Coaching business because I moved my business to another country, relaunched it and grew it to 6 figures in under 3 years. Practitioner friends said that they noticed me everywhere online, followed my every move, watched my videos and read and commented on my social media posts. They saw how I was marketing my business and how quickly I was growing, growth without any help from much-relied-upon referrals or a network of family and friends. The majority of therapists seek my help when they want to develop their business further and are not sure what they need to do differently or additionally. Many describe the feeling of being ‘Stuck’. They may have been a therapist for a few years but feel out of their depth with the latest technology and social media, and find that traditional ways of marketing and advertising themselves are not generating new clients or income. Running out of ideas on how to generate more business, and being stuck in a rut are common concerns. Other therapists have been building up their client base but are frustrated that some months are quiet. They want tangible goals for getting new clients and a proper strategy for keeping happy clients coming back regularly. They feel unable to get to grips with momentum, and consistency with planning and marketing their businesses. For clients that are just starting out, or have therapies as a sideline that they want to make into a full time career, have different objectives. Diplomas, courses and CPD develop their technical therapy skills but not their business and marketing, and they find it frustrating to get clients in to their therapy room. They may do a lot of things on Social Media, but they don’t get the interaction they hoped for and therefore few bookings. Practitioners want guidance on how to use social media effectively. They know that it takes time to get going as a therapist and rely heavily on word of mouth, but how do you get word of mouth going when you have very few clients who either don’t come back, or dwindle after a few weeks? Truth is, a shift in mindset aside, there is very little that cannot be achieved without a really great, effective marketing and sales strategy for attracting new clients and a plan for retaining those clients that see so much value in what they receive and cannot do without their regular support. So the value and rewards are equally reciprocated. How can I work with and receive help from you? I am a complementary therapist as well as a business coach & mentor. I share my time between these two aspects and therefore, have created specific space each week to focus on each of these individually. Via my Membership Community; Practitioner Profits Online, which is geared towards getting the most from your social media activity with the objective of attracting more clients, giving them what they need and making more income for yourself. 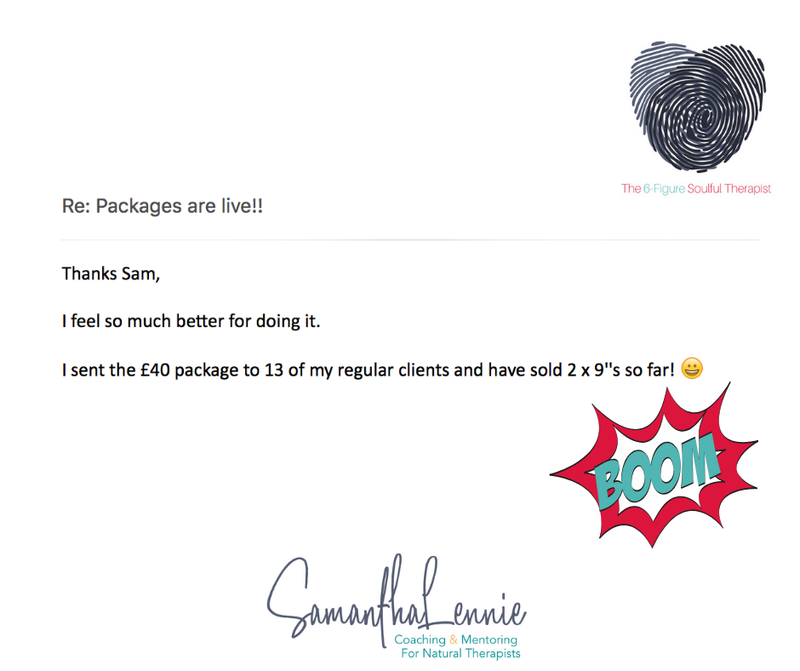 Alternatively, if you would like to work privately with me and receive 1-2-1 support and ongoing guidance, to really uplevel your business and your brand, create premium pricing and have you standing out pre-eminently in your location and vs. your competition, The-6-Figure Soulful Therapist Program & Mentorship is for you. In this program I share everything I have learned and implemented in my therapy business that has earned me 6-figures in just 3 years. You may be skeptical and this might seem like an insurmountable goal, and you might even question whether it is possible for you. I’ve done it, and I know you can too! I will shake my pom-poms and champion you, all the way. For more details and to book a Complimentary Discovery Call with me, go HERE.